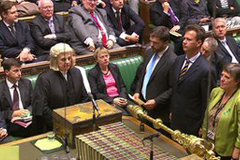 British MPs have voted against possible military action against Syria to deter the use of chemical weapons. David Cameron said it was clear the British Parliament does not want action and "I will act accordingly". The government motion was defeated 285 to 272, a majority of 13 votes. Prime Minster David Cameron said it was clear Parliament does not want action and "the government will act accordingly". It effectively rules out British involvement in any US-led strikes against the Assad regime. And it comes as blow to the authority of David Cameron, who had already watered down a government motion proposing military action, in response to the opposition Labour Party's demands for more evidence of Assad's guilt. Labour had seen its own amendment - calling for "compelling" evidence - rejected by MPs by 114 votes.